A long day, getting longer, getting late. Hundreds of miles traveled, dozens of people encountered. Solitary relief was planned. The weather had other ideas. Plans for a grasslands hike were washed out by afternoon rain. It promised to wrap the explorers in a wet blanket of grass, trees, and mud. The primitive backcountry beckoned the Mild Manner Explorers. These adventurers would go without their fix. Reluctantly, the pair realized their hankering for a dose of Badlands would simmer with no promise of relief. Hope replaced satisfaction. Maybe the clouds would break enough to provide a satisfying hit of sunshine and vivid sunsets. The quickest dose of rugged creation wouldn’t last long. Behind a curtain of clouds, the sun made a beeline to the horizon. The Mild Mannered Explorers took a quick turn at the bottom of the hill near the Little Missouri River. Grey filtered light welcomed them to the North Unit of the Theodore Roosevelt National Park. Foiled again. Storm clouds backed up, piled up and blocked up the western horizon. No sun. No sunset. So, alternate plan C, just a drive through the park to see if we could get any fresh images of bison. They were moving toward the road, first on a hill above the road, then down to the road level. To some cows are cows are cows. To this pair of searchers, these bovine oddities tell a huge story of national importance. They’ve been a staple of the Theodore Roosevelt National Park for years, and are sort of a living history. 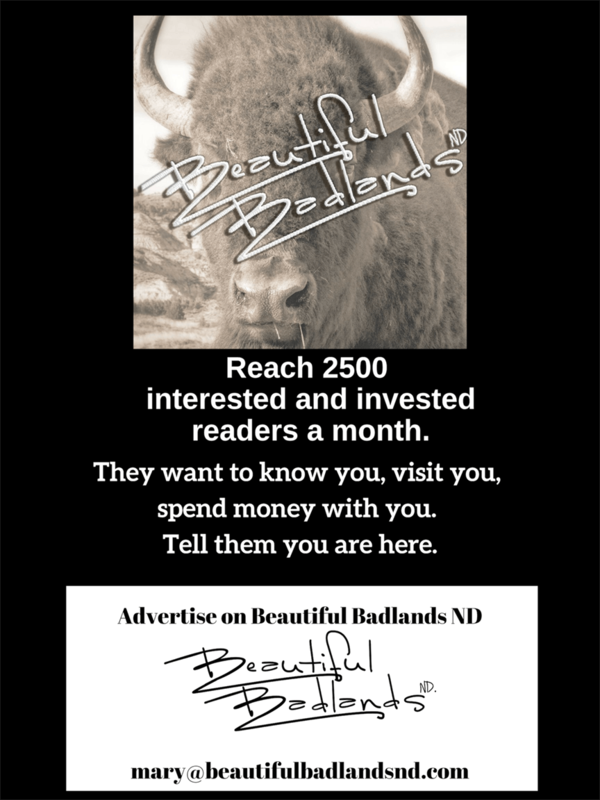 The scrawny, horn-heavy beasts are symbols of ancient prehistoric migration, the War Between the States, Reconstruction, and the settlement of the Dakota Territory, which is the story of the development of modern ranching. Some we recognized from earlier encounters — especially the one we call “Twisted” who’s massive spread of horns are skewed. The herd seemed to just be out for an evening stroll. Then it became clear, they were headed to their happy hour drink from the Little Missouri River. They filed across the bottom ground, up over the hills to the water, first at a smooth saunter, then a light run. Perhaps their goal was to beat the bison to the water. After the beef moved on, the bison sauntered along the paved road in the park, headed in the same direction, but with much less urgency. The Mild Mannered Explorers shared the right of way. After all, the Theodore Roosevelt National Park is their home. We’re just visitors. The big critters moved on. Evening big animal spotting was a success. Thanks, longhorn steers and bison! Lesson learned. When looking up for a sunset doesn’t work, look around for life — wildlife. The Mild Mannered Explorers will return for more longhorn steers and bison. Maybe even another stab at the Summit Trail. Can’t get out to the Badlands as often as you like. We’ll provide vicarious enjoyment. Just subscribe to get a note in your inbox when a new story is published. You can follow us on Facebook, ya know. And of course, if you know someone who could get a bit of excitement, encouragement, education or edification from longhorn steers and bison, just click the “share” button.